A drop set is a muscle growth technique used to increase exercise intensity. To perform a drop set, immediately following your last rep of your last set, you quickly decrease the weight by 10-30% so that you can pump out two or three more reps. This allows a bodybuilder to push the intensity past momentary muscular failure, thus causing more muscle damage, which will trigger increased hypertrophy (muscle size). Drop sets are typically used when a bodybuilder reaches a plateau, which is when gains seem to slow down or stop. The human body becomes accustomed to the same routines and stresses, which makes it imperative that thing get occasionally “shaken up”. The body will begin to respond to new and different stresses such as drop sets and forced reps and other techniques discussed on this website. To prepare for a set using drop sets, you will want to have several different weights available. If using barbells, you will set them up to be able to quickly remove plates, or swap in lighter plates. Having a training partner is ideal, but it can be done alone. If using dumb bells, simply have several pairs available of progressively lighter weight. For example, if you are doing incline dumb bell presses, maybe your normal weight is 90 lb dumb bells. You may want to have 70’s ,50’s and 35’s ready to grab. Drop sets are easiest if you are using machines with a selectorized weight stack, as all you need to do is select a lighter weight after each set. Here is an example using seated dumbbell curls: You are performing your last set of dumbbell curls with 35 pound dumbbells. 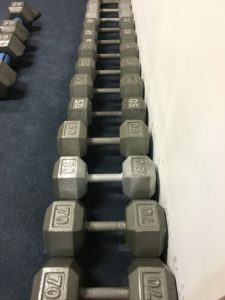 You have just performed nine reps and no matter how hard you try, you can not get that 10th rep. As quickly as possible, drop the 35 pound dumbbells and pick up 25 pound dumbbells and continue until you reach muscular failure again. Now drop the 25 pound dumbbells and quickly grab 10 or 15 pound dumbbells and continue once more. Your biceps muscles will be more exhausted now than they would have been if you’ve had stopped the set on the ninth rep of your last set. ​For barbell exercises you may have to stop, get up and remove plates from each side of a barbell in order to reduce the weight for your extended set. If you train with a partner or several partners on an exercise such as the bench press, you can have the partners remove the weight plates on each side and you could immediately continue your set with the lighter weight. If you’re using a weight stack on a cable machine, you simply need to stop, pull the pin and select a lighter weight. How many Drop Sets and reps should I do? ​This will vary depending on your personal ability, desire and pain threshold. The amount of weight you remove after momentary muscular failure also has a bearing. Aim to reduce the weight by 10-30% for each drop set, but realistically it does not matter how much weight you drop as long as you can get another 3-6 reps with the lower weight. 2-3 drop sets is typical, but you can do more if you are able to continue to get reps on each lighter set. ​Drop sets are quite effective in taking a muscle to complete exhaustion, so use them sparingly. I would not use them more than once every couple weeks for any given muscle to allow for proper recuperation and growth. ​Once you see how to do Drop sets, you realize they can be done with virtually any exercise and they are a simple way to increase intensity in your workouts.